Love and War among Ichthyosaurs - how aggressive were "Fish Lizards"? Just how mean and nasty were Ichthyosaurs, the most fusiform of marine reptiles, especially when it came to their own kind? And was any inter-species aggression related just to disputes over territory and fighting over mates, or did it actually extend to the mating process as well? 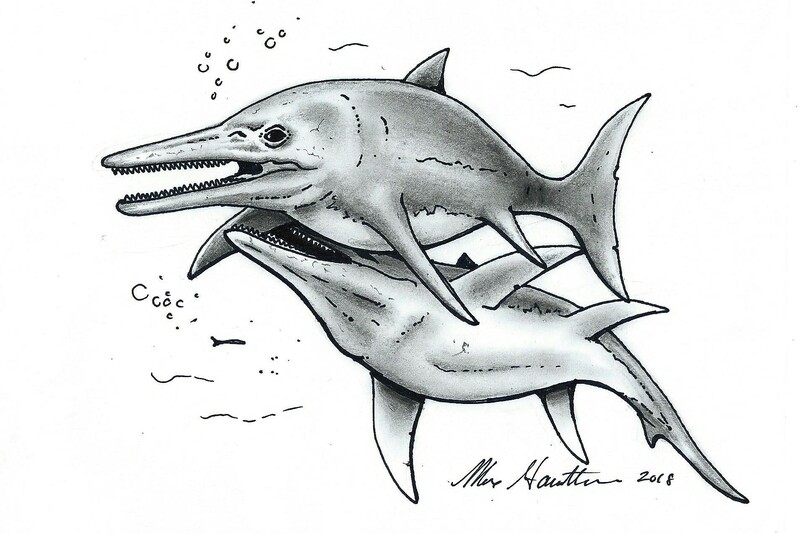 “Jurassic Love Bite” by Max Hawthorne – two Ichthyosaurs (Temnodontosaurus) mating. These questions came to mind as I examined one of the newest additions to my fossil display case, a rare Temnodontosaurus intermedium (Jurassic period, from the Lower Lias, Church Cliff Bay, Lyme Regis, Dorset, UK). Originally misidentified by the dealer as being a coracoid, I have vaunted Ichthyosaur expert Valentin Fisch to thank for correctly identifying it as a fore-flipper bone. Based on morphology, I would go so far as to say it came from the animal’s right side as well. What is unusual about the specimen (Valentin estimated it at 6-7 meters, so around 20-23 feet – the size of a very large great white shark) are the tooth marks gracing its dorsal surface (see photo). There are at least three grooves, closely grouped, and of varying thickness. At first, I presumed this to be feeding damage, i.e. something had eaten the Temnodontosaurus and left its toothy calling card on its bones. Temnodontosaurus Ichthyosaur intermedium showing tooth damage. From the author’s private collection. A pliosaur seemed a likely candidate, but when I reached out to him, paleontologist Paul DeLasalle reminded me that Temnodontosaurus was a hypercarnivorous Ichthyosaur, at a time when pliosaurs had yet to reach awe inspiring sizes. 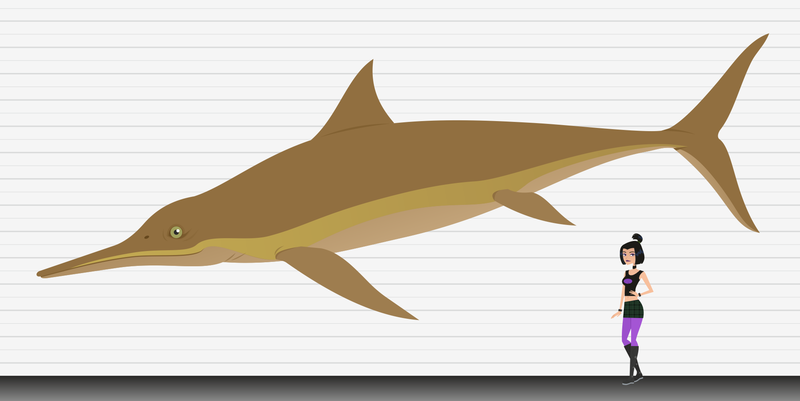 In other words, at a maximum length of around 40 feet, it was the apex predator of its day. So, if it wasn’t a pliosaur, what could have made these marks? Based on the closely-knit gouges, the answer became obvious: another Temnodontosaurus. Was this feeding damage, however? Based on bite location and visible scoring, I don’t believe so. It appears that another Ichthyosaur (presumably the same species), possibly a larger one, approached “my” animal from the right rear and administered a nasty bite to its right pectoral fin. The marks don’t indicate pure punctures, however, but instead gouges of varying depth that were caused by the bite’s recipient pulling roughly away. This caused the attacker’s teeth (which are designed to pierce, not dismember like a shark or pliosaur, hence feeding on something so large was most likely not the goal) to drag backwards, lacerating the cartilage covering the victim’s fin, and damaging the underlying bone as well. This outline, which I added to an Opthalmosaurus pectoral fin, shows not only the location of the intermedium, but also how the flipper was gripped by the attacker. 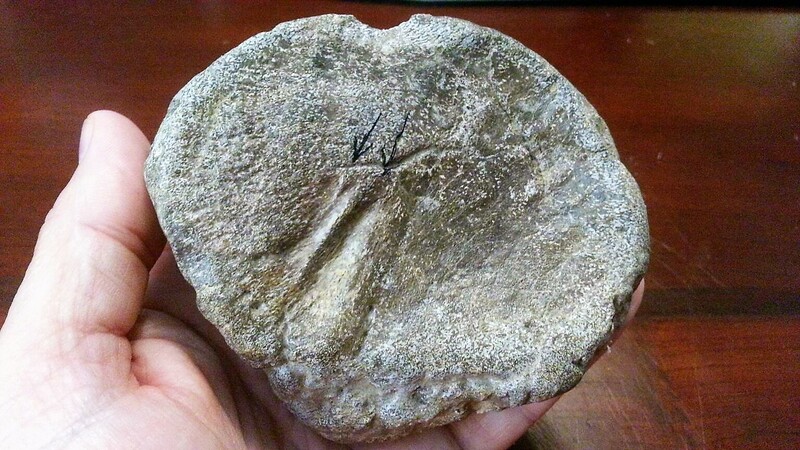 Ichthyosaur paddle, showing outline of attacker’s jaws. The last possibility, and one that intrigues me, is that it may have been mating damage. I don’t know if any work has been done in this area, and I suggested it as a possibility to Valentine Fischer, but it seems to me that, based on the bite location, it may have been a “love bite” from a particularly amorous male Temnodontosaurus, trying to “get his groove on”. Now, the depth of the wounds and damage to the bone does seem rather extreme for reproduction, but let’s consider extant great white sharks. Male sharks of most species tend to bite the female’s flanks, gill region, and pectoral fins during copulation. In great whites, it’s even worse. Male great whites often inflict horrifying bites on the females of their kind, presumably to either manipulate her during copulation or to convince her of their strength and worth and to encourage her to mate. 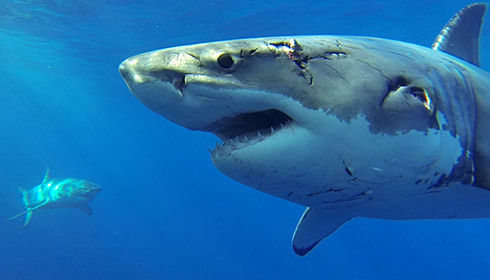 Some of these wounds remove huge hunks of tissue, occasionally exposing the gills themselves – wounds one would think should be fatal, yet somehow the female survives and recovers. That said, it is distinctly possible that a macropredatory species like Temnodontosaurus engaged in similar, rough-and-tumble mating practices, and may well explain the damage present on my fossil. I’d be very interested to see if there is other evidence out there to support the notion of aggressive Ichthyosaur mating, and how many other fossils out there bear similar healed-over wounds. Thanks for stopping by, and I hope you found this post interesting. 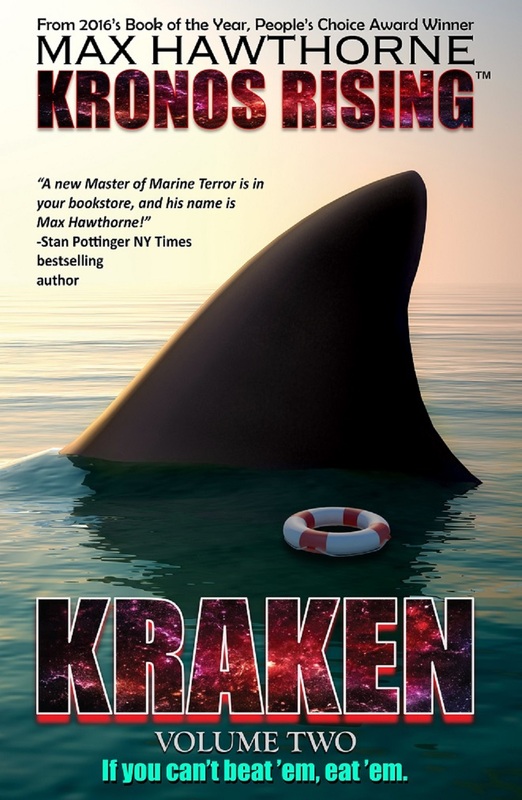 If you haven’t gotten your hands on a copy of my latest novel, Kronos Rising: Kraken (volume 2), by all means get one. You will not be disappointed. https://www.amazon.com/gp/product/B07DJZ84VH/ref=series_rw_dp_sw Added bonus: if you have either Amazon Prime or Kindle Unlimited, you can read Kronos Rising, book one in the series, via Kindle for FREE right now. Limited time offer, so don’t wait! 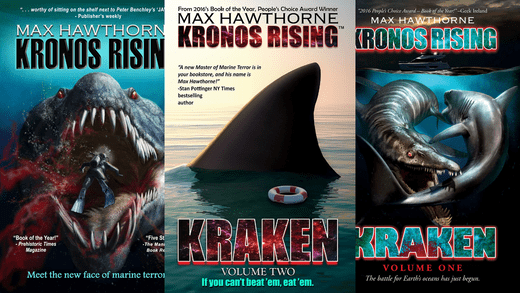 KRONOS RISING: KRAKEN vol. 2, now available in hard & softcover and eBook formats.